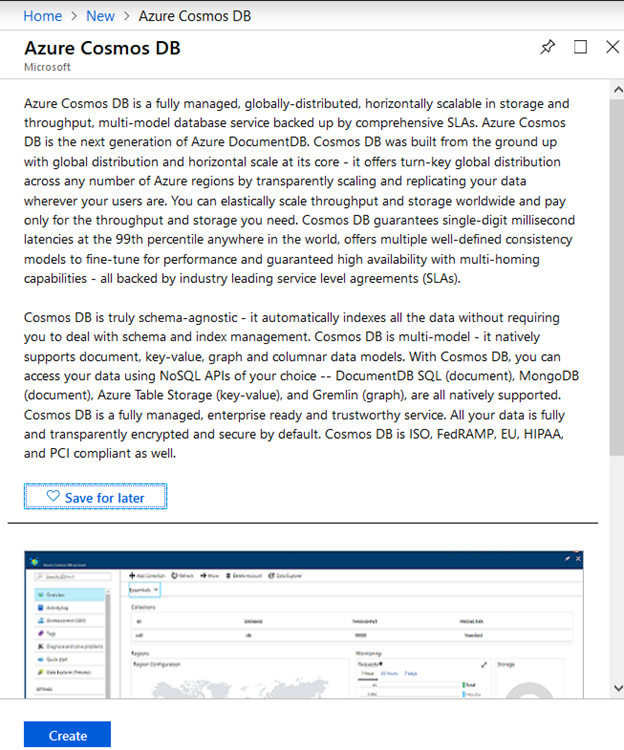 cosmos db – Microsoft Azure Articles..
Cosmos DB is gaining Traction exponentially & I would like to list the advantages of Cosmos DB here. Globally Distributed means scalable across all countries & regions. Low Latency is the core advantage of Cosmos DB. This is achieved through SSD based storage, planet scale flexibility providing Millisecond response time. Flexible Consistency offered through Varying Consistency Models like Strong, Boundless, Session, Prefix, Eventual. Flexible Pricing Model allows metering of storage & throughput independently rather than CPU/Memory/IOPs. 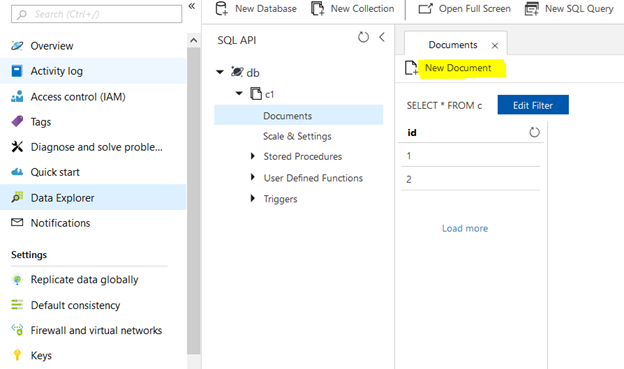 Multi-API Model allows querying the database in SQL for document, MongoDB for document, Azure Table Storage for key-value, Cassandra for columnar etc. High Security achieved through End-to-end Encryption on data-in-transit & data-at-rest. In this article we can explore about Cosmos Db database & its usage. Azure Cosmos DB is a globally distributed, multi-model, planet-scale, low-latency, high-availability, No-SQL database stored as JSON format. In the olden days Cosmos DB was called as Azure DocumentDB. Azure Cosmos DB will be replicated based on Geography region & hence low-latency. There will be Primary Write-database in one central location & Multiple Secondary Read-databases in multiple locations. Due to the multiple geographical location availability low-latency & high-availability is possible. JSON Format is used to store the data in Cosmos DB. Cosmos DB have 5 consistency levels to ensure consistency, availability and latency trade-offs. 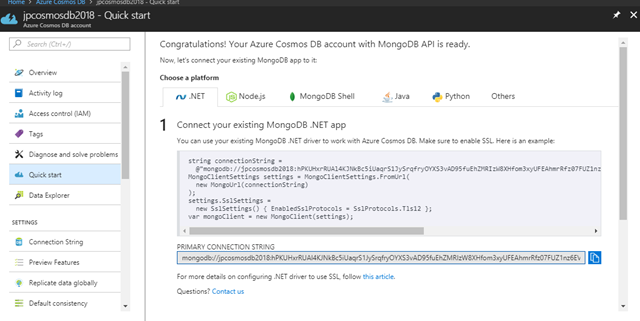 We can create Cosmos DB from Azure Portal as shown below. Click the Ok button & Wait for few minutes for the Creation to be completed. You will get the following screen after creation. Start by Add Collection. Then Add a New Document. You can add new properties in the document. The data is stored as JSON file. Ensure the ID is unique. Now we can query the database using SQL. 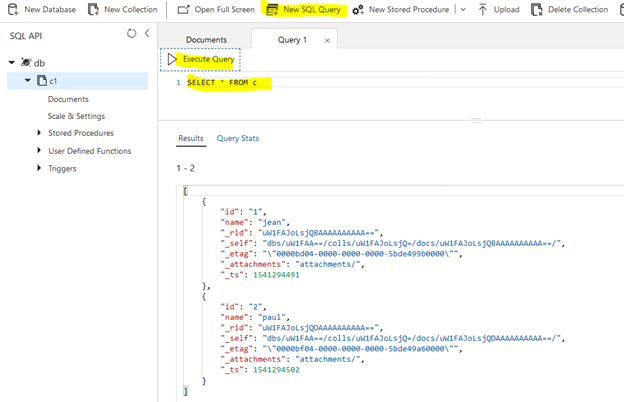 Choose the New SQL Query option > Enter SELECT statement & Execute the Query. You will get the following results as displayed. In this article we have explored about Cosmos Db database & its usage. 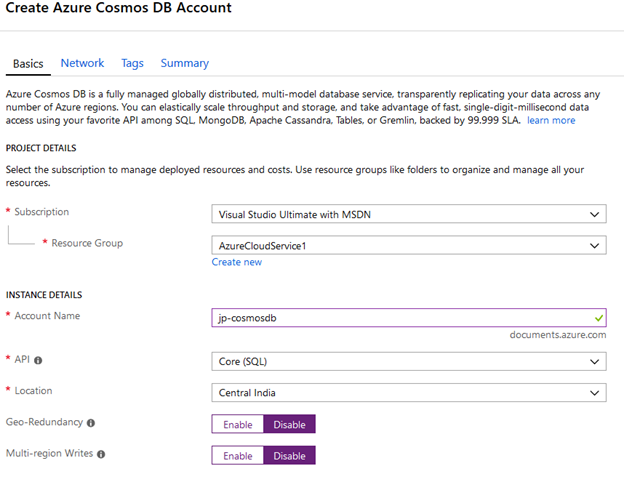 Azure Cosmos DB provides a NoSQL database in Azure premises. It is globally distributed, highly available, massively scalable database. It is an extension of the previous DocumentDB which was used for storing databases. Following are the Advantages of Cosmos DB. Multi-API It supports sql, mongodb, cassandra, azure table, gremlin apis. 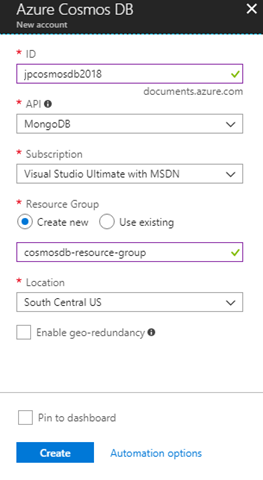 Open Azure Portal > Search for Cosmos DB > Use Create Option as below. Enter the details in appearing window. 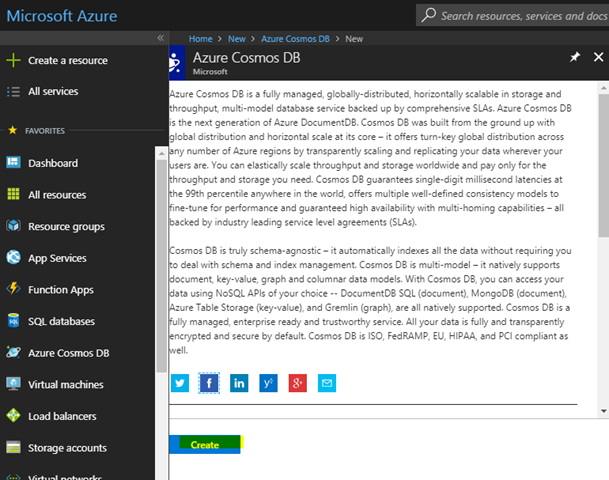 You can access the same from Azure Cosmos DB tab from the left. Clicking on the Quick Start pane will give you the Development Code & Samples.